transport, store display and ownership by the consumer. Plain uncolored and unscented candles are also prone to changes in the appearance and performance of their base wax when subjected to light and heat. Unprotected waxes are prone to yellowing or browning and to thermal oxidation which affects the burn performance of the wax itself. Candle stabilizer blends are performance additives formulated to help protect the basic components of a candle from undesirable changes that may occur owing to the combination of light, heat and, chemical reactions with the wax, dye color and, fragrance components. The protection of fragrance is important during the candle manufacturing process, as that process involves heating the wax and fragrance combination. 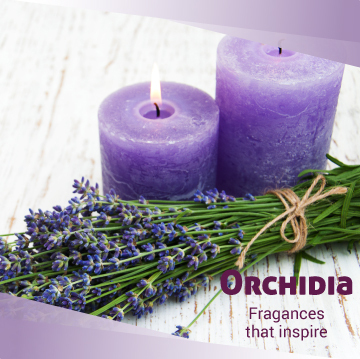 Fragrances may develop a distinctly oxidized smell when they are exposed to light. The right candle stabilizer blend is an important tool in the preservation of the original odor profile of the fragrance. The least understood candle burn performance issue known is fragrance polymerization. It has been shown capable of causing a darkening of the wax melt pool, wick mushrooming, increased viscosity of the molten wax, formation of precipitates alongside the wick, wick clogging, flame reduction, candle tunneling and, other undesirable changes during the burning of the candle. Overall product performance is affected by flame attenuation, decreasing wax pool temperatures and size (diameter) during the burn cycle accompanied with a decreased fragrance throw intensity. In extreme cases this leads to the point of complete shutdown of the capillary flow of wax up the wick, thereby blocking combustion altogether. A scented candle made using a suitable candle stabilizer package is superior in terms of the reduction of these undesired changes. Light is composed of waves of different lengths. The energy stored therein can weaken and destroy the raw materials of the candle. UV absorbers are used to protect candles from the light energy found in retailers’ store illumination and from the UV found in general light. These chemicals collect the high-energy UV rays and release this energy as heat. This helps prevent the candle from yellowing and fading. Candles are generally manufactured with liquid wax that is usually heated during transport, storage and when being processed into candles. Fully refined waxes have better heat resistance. 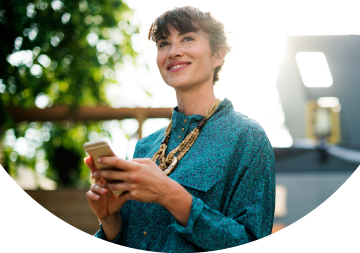 Dyes, fragrances and semi-refined waxes are less thermally stable and can be damaged by heat during transport and production. Antioxidants are used to decelerate the oxidation of dyes, fragrances and waxes. Initially, the HALS are activated by the reaction with a radical or a hydroperoxide in the candle, converting them into radical scavengers. The scavengers produced in this way are then capable of trapping and destroying other radicals in the matrix, thereby creating a chemically stable molecule. The HALS in the formulation is never used up, but is continuously regenerated. 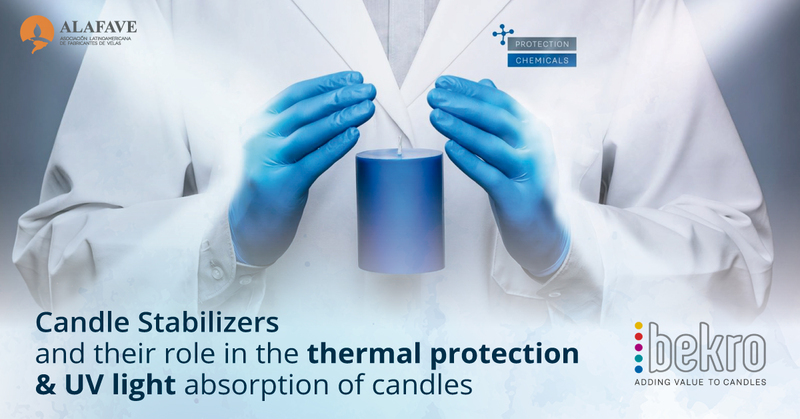 Stabilizer blends specifically developed for candles, help protect them and all of their basic components – dyes, fragrances & waxes – from light, heat and chemical reactions, during and after production. Candle stabilizers contribute to a consistent product with an extended shelf life. Candle stabilizer dosage ranges between 0.15% and up to 0.50% for most reactive situations. Typical dosage starts at 0.20%. ¿Cúál es el precio por kilo de los estabilizadores ofrecidos por Bekro?